MoebiusArt News: Audrey Hepburn "Tiffany Blue"
Icon "Audrey Hepburn", as elegant (and as playful) as ever, wearing the diamond necklace and hair clip that the actress wore with the iconic black Givenchy evening gown as Holly Golightley in the film Breakfast at Tiffany's. 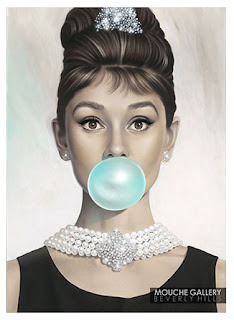 Michael unveils the 2nd release in the Bubblegum Series, "Tiffany Blue" This is a Giclée Print on Canvas, Hand Signed by Michael Moebius. Pre-Publication Pricing for Limited Time. Limited Edition of 250. For availability please contact Mouche Gallery Beverly Hills. Michael Moebius on the Cover of "Robb Report"